Comedy is a strange thing. Many write it off as merely jokes with little meaning, but comedy is one of our biggest and most pervasive cultural forces. So, be careful what you joke about, because hey, jokes do matter and it’s extremely easy to be very funny without tearing down marginalized groups. I see it happen literally all the time. Anyway, tonight you can see performance artist Dynasty Handbag perform their new work that riffs on “white activism” (#resist by buying this shirt about feminism!) and solo shows made by privileged heterosexual women with little self-awareness, which I also see happen all the time. 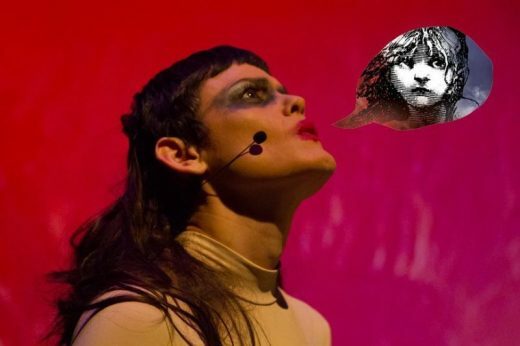 After the performance concludes, the artist will be joined by Morgan Bassichis, Dominique Nisperos, Keisha Zollar, and moderator Bess Rowen for a discussion about the role of comedy in times of political unrest, and how one can utilize the genre to productively take on the establishment. Ah, roasts. No, I don’t mean cookouts or that ceremony where you put the whole pig in the ground and take it out after a while. I am talking about the weird comedic ritual of hurling insults in a way some take as complimentary, ultimately. In my opinion, it is too easy to resort to cheap shots in a roast. Unless maybe you are roasting a white man who does not have many redeeming qualities. In any case, at this show you needn’t worry about expecting to laugh at any cruel or dumb retorts. In fact, Boast Rattle is a night of fierce compliments. 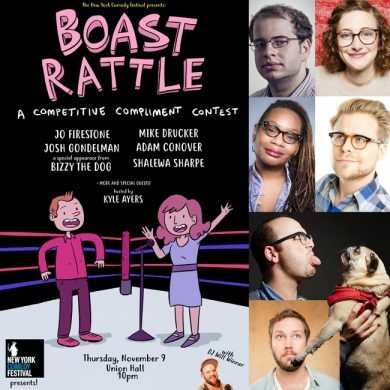 So, you can sit back and watch Jo Firestone, Josh Gondelman, Mike Drucker, Adam Conover, Shalewa Sharpe, and even Bizzy The Dog cook up their best words of praise to each other. Plus, this edition of the show is part of the New York Comedy Festival, so maybe you will feel fancier in the audience. 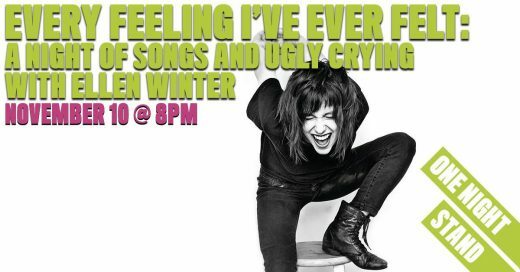 When it comes to feelings, composer and musician Ellen Winter has many of them. So many, in fact, that she’s written an entire show to expose them all to you. Her one-night-only show at Ars Nova (where she also interned several years back) not only has a hefty dose of emotions all along the spectrum (and probably more than one or two tears), it also serves as a showcase of songs she’s written over the years, from renditions of punk songs past to new material from her upcoming solo album. With some rare actual good news coming from the most recent local elections and the inevitable advent of chillier weather and seasonal depression, I have also been feeling many types of feelings. It can always be a treat to experience them with a roomful of others, set to a handful of songs. Created by Murielle Borst-Tarrant of Spiderwoman Theater with music direction by Kevin Tarrant, Don’t Feed The Indians takes common Native stereotypes and subverts them in a satirical, musical night performed by actual Native artists. May the future only bring more and more work like this.